Digital transformation has dramatically changed the relationship between brands and consumers. We now live in an on-demand economy, where the thoughts, needs and behaviors of consumers are influenced by countless brand touch points across a constantly growing digital ecosystem – all in real-time. Digitally-native challenger brands are forcing traditional brands to rethink their strategies and use technology to drive innovation, not just to manage existing processes. There is a massive opportunity for enterprises to use analytics to predict consumer trends, identify smaller competitors early on, and act fast to gain competitive advantage. Identify viable trends vs. fads and shortlist what trends are important and worth investing in based on your industry, trend timeline and more. Understand the driving forces behind trends to create an effective go-to-market strategy for new innovations. Leverage the power of AI/ML to apply insights for product development and innovation, marketing, supply chain and more. Understand how digital businesses of today can tap into insights obtained from customers to make informed and successful product innovation. 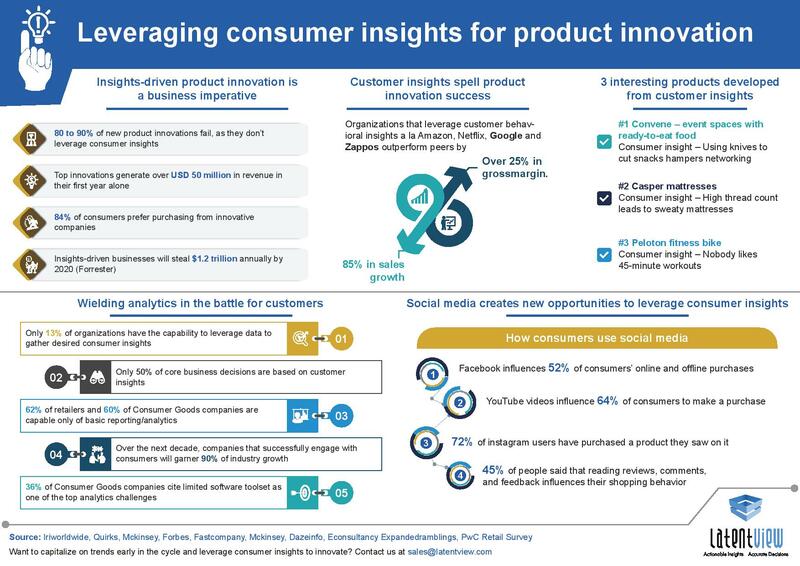 This infographic looks at some interesting industry data points that re-iterate the importance of social media and analytics in innovation.